Handworked items, especially those used every day, hold a special place in my heart. They stir memories of times past and of the people who worked them. Among the textiles I've saved over the years are nine handworked handkerchiefs, all family pieces. I look at them and memories of my grandmother and great-grandmother flood back to me. Handkerchiefs like these were everyday items. Any lady with a sense of propriety carried one and the more beautiful, the better. Although practical necessities, they were also social signals, conveying not only the lady's needle skills but her status. This was before Kleenex, which was introduced in 1924. I surely have these as my grandmother thought I should carry one, but I never did. However, I certainly remember those who did. The last wave belonged to my grandmother's era, who was born 1899. I estimate the end of the practice to then end of WWII--and the early 1950's at the latest. At least in Ohio. Cotton 'blanks' were widely available. In my town, the five-and-dime stores--Woolworth's and Kresge's--offered these squares of finely woven cotton, which were hemmed on the edges. They came in various qualities and some featured machine embroidery in one corner. The handkerchief second from the left on the bottom row in the lower photo is an example. 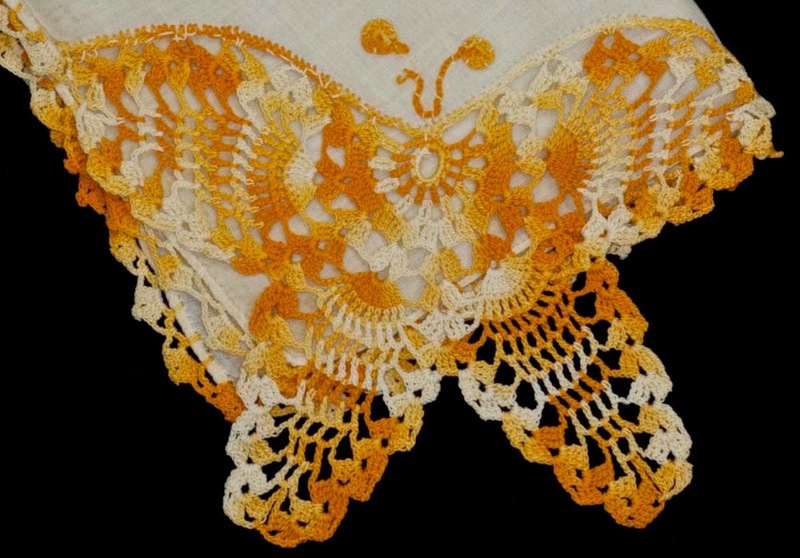 The crocheted 'Butterfly' hankie, at top right, was surely a showstopper when pulled out of any lady's purse. Although the edging on three sides is simple, the insertion of the butterfly demonstrates much more skill. The 'blank' hankie was cut to the shape of the upper butterfly wings, machine hemmed and finished with single crochet. Lastly, the butterfly, which had been worked separately, was sewn on. 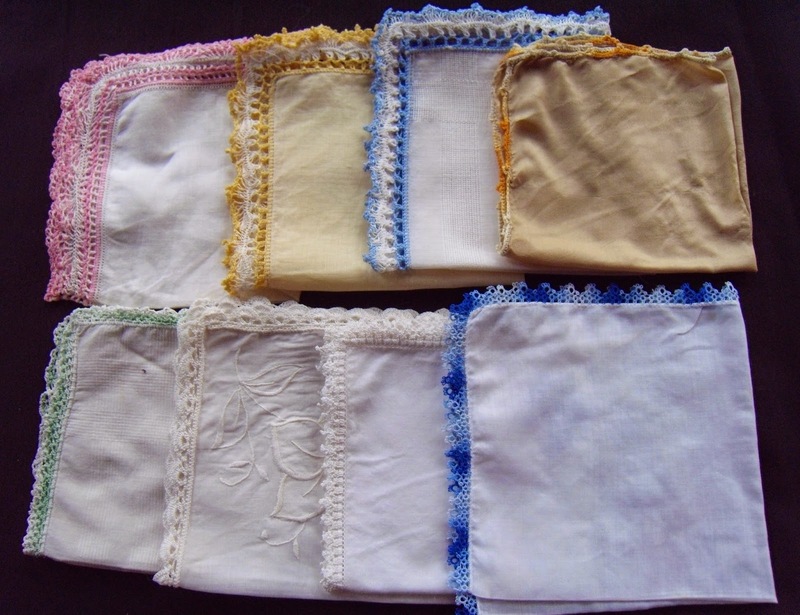 The oldest hankie is the tan one on the top row, far right. It was made by my great-grandmother, who was born in 1874. I barely remember her, but I remember her house and that she was nearly blind. Even so, she kept crocheting. The edging is simple so I suspect this was done later in her life, likely in the 1940's or early 1950's. I don't ever recall seeing her knit. I sort of remember that she could knit, but preferred the crochet hook. Fortunately for me, she was a patient teacher--and my needlework mentor. As a young girl, she taught me to crochet, tat, as well as hairpin lace and its bigger brother, broomstick lace. I remember crocheting a red bucket-style purse with a round bottom and a gathered closure. It must have been 'beautiful'--as such self-made creations are to 10-year-olds--but I have no regrets that is not among my textile treasures. I am so glad that you wrote about these treasures! What amazingly detailed work, especially the tatted one.